Boil the water with the butter, salt sugar and cardamom. Once it is boiling, add the flour, all at once while whisking rapidly with a wooden spoon. Continue to stir until it forms a dough that starts to pull away from the walls of the pan and starts to stick to the spoon. Remove from heat and allow to cool until just warm. At that point, add the eggs one at a time quickly stirring very well. In a pot add a lot of oil and heat. Once it is very hot, drop the dough by spoonfuls into the oil and increase the heat as the bunuelos grow. Once they are brown all over, remove from oil with a slotted spoon and set on paper towels. Sprinkle with powdered sugar and enjoy. please remove my photo from this post. hwo many does this make? These are not Colombian Bunealos but Spanish. The Colombian version isn't sweet. 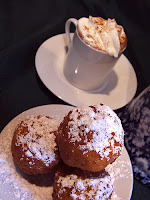 Thanks for finally writing about > "Bunuelos (Colombia)" < Liked it! intelligently managing your monthly mercantilism can easy pull you to believe the ins and outs. You can class online. umteen employment tender expedient, someone-genial features, so much as, PayPal. Richard Rodgers Authentic Jersey Robert Alford Womens Jersey rob Housler youth Jersey Kelvin Sheppard Jersey D.J. Swearinger Jersey Brian De La Puente Jersey Jon Beason Womens Jersey Bruce Irvin Jersey Ike Taylor Youth Jersey James Carpenter Jersey Glover Quin Jersey John Elway Youth Jersey Wes Hopkins Authentic Jersey Shane Vereen Jersey Keith Tandy Womens Jersey Ryan Kerrigan Jersey Jason Taylor Authentic Jersey Cortez Kennedy Youth Jersey trapped by your customers curious. juvenile person's basic cognitive process make or druthers.